27 contributors! 50 amazing effects! Some of magic and mentalism's most trusted authorities have collaborated to bring you this outstanding collection of time tested and audience proven effects. Not just one or two routines, but fifty from which you can easily select several excellent psychic programs. A Genii Award-winning book, now brought up to date in this latest, revised edition. Effects from John Booth, Paul Curry, Eddie Clever, Norm Cummins, Bruce Elliott, Dr. C.G. Ervin, Hen Fetsch, Dr. Walter Grote, Stewart Judah, Capt. Jones, Joe Keller, Fred Kolb, Wilbur Kattner, Bill Larsen, Richard Lindahl, Orville Meyer, Bob Nelson, Al O'Hagan, Dr. Wm. Palchanis, Andrew Smythe, Dr. Harlan Tarbell and Jack Vosburgh. Your audience will thrill to Judah's Sealed Billet Reading; Dr. Grote's Telepathy vs. Coincidence is an outstanding mental accomplishment, with full patter; Frederic Kolb's Dead Name Duplication is a knockout; The Green Hand and 8th Key to Baldpate will intrigue any spectator; Grant's Prediction Deck can easily be made and is a brain buster; A terrific slate routine by Norm Cummins, using ordinary slates; Eddie Clever gives you 'Out of the Ether'; and many other super miracles. 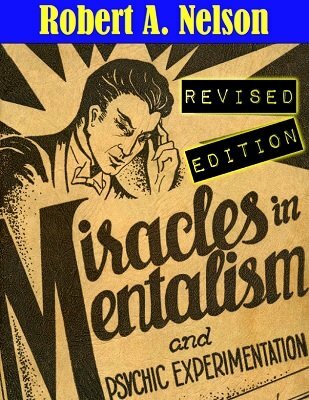 1st edition 1945; this digital edition revised, corrected, with added photos and illustrations, 65 pages.